The painting was commissioned by the end of 15th century to Leonardo by Ludovico Maria Sforza (also known as Ludovico “Il Moro”) when he was given the prestigious honorific title as “ Cavaliere dell’Ordine dell’Ermellino” by the king of Naples. 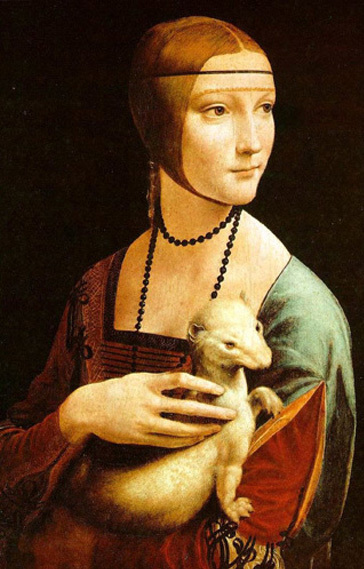 The painting depicts the young Ludovico’s mistress, Cecilia Gallerani, holding an ermine on her lap whose pristine white fur symbolyzes purity and integrity. The greek word for ermine is “Galè”: this is supposed to be an undisputed hint to Cecilia Gallerani. As a matter of fact, the little animal resembles more a ferret or a marten than an ermine: these animals impersonate the meaning of lust, quite the contrary of chastity and purity.. 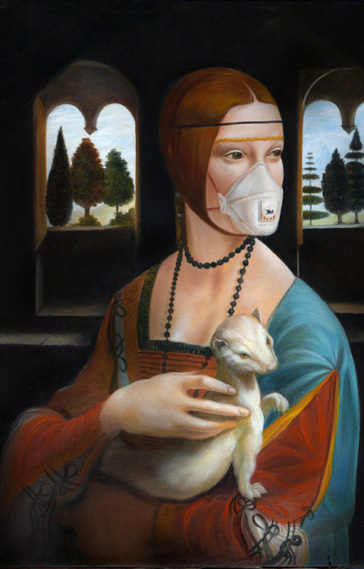 The truth is that recent studies, performed with cuttingedge technologies capable to virtually penetrate the painting’s layer, proved how Leonardo painted a slim and delicate ermine in the very first place. Due to the persistent Duke’s demands, he painted it once more to shape him bolder, powerful and more robust in order to mirror the Duke’s personality of influential man of power and warrior.